Geneva —The decision by Saudi Arabia, United Arab Emirates and Bahrain to sever ties with Qatar will deeply and negatively affect residents in all of these countries, including their access to education, right to property ownership and freedom of expression, warns the Euro-Mediterranean Human Rights Monitor. The order for the eviction of Qataris from these countries will adversely impact nearly 6,500 families, according to research conducted by Euro-Med. If the standoff is not brought to a positive end, 6,474 families will be separated or displaced because one of the parents is a Qatari citizen and the other holds a Saudi, Emirati or Bahraini passport. Such a situation means that one of the parents will be forced to leave the family’s country of residence, with or without the other members. In these countries, a mother cannot pass her status to her children, and dual citizenship is not permitted. “The Emirati authorities told me to leave the country within 14 days,” reported a Qatari woman married to an Emirati. Now she is does not know whether she should leave her husband or stay in violation of the new law in the UAE. Another 29-year-old Qatari woman told the Euro-Med team that she is married to a Bahraini man and they had been living together in Qatar. Once ties between the countries were cut, he traveled to Bahrain to register their child for citizenship. However, this has proven to be impossible, since he must provide documents from the Qatari embassy in Bahrain, which now is closed. Another 27-year-old Qatari citizen living in Bahrain, who only would give his initials as H.A., came to Doha with his son to visit his elderly mother, intending to take her back with him to take care of her. However, because of the Bahraini decision to prevent Qataris from entering the kingdom, that no longer take is possible.Mohammed Jaber, a Saudi citizen, told the Euro-Med team that his father died three days ago in Qatar’s Hamad Hospital, but his family cannot take his body to Saudi Arabia for burial since the border is closed. Cutting ties with Qatar also has had a direct effect on work and labor rights for thousands of employees and their families. Nearly 2,000 workers (1,954) who have Saudi, Bahraini or Emirati citizenship will be forced to resign and leave their jobs in Qatar during the next 10 days. Most of these employees have family ties in the country and their children attend Qatari schools. Another 11,387 individuals holding Saudi, Emirati or Bahraini passports will be forced out of Qatar. For example, a man going by the initials of H. A., age 32, holds Saudi citizenship and lives with his Qatari wife in Doha. He said he now must leave his job of 13 years, forced to depart the country with his children, leaving his wife behind.The same situation applies to hundreds of Saudi, Emirati and Bahraini individuals owning companies and enterprises in Qatar, as well as Qataris who own property in those countries. Their forced departure will result in a significant loss of capital, as well as breach of commercial agreements and commitments. Another Qatari citizen, 30, reported to Euro-med that he has 50 camels in Saudi Arabia and is sponsoring four workers there. However, now he will not be able to travel to the country to monitor his enterprise. His entire operation will be jeopardized if Saudi Arabia withdraws his four employees’ residency permits and forces them to return to Qatar. Another 39-year-old Qatari citizen expressed his concern that his company in the UAE will suffer large losses, estimated at millions of riyals, since he can no longer access his property. "I bought a ticket before the crisis started on Emirates Airlines and then I got an email from them saying my flight was canceled,” he reported. “when I tried to travel via other routes, I could not because of my Qatari citizenship." Euro-Med estimates the decision by the involved countries will has a negative impact on 706 students from the three Gulf States that cut off diplomatic ties with Doha, but who are studying in Qatar. These students will not be able to complete their university studies, since their home countries are forcing them to return immediately. The governments of the three countries have announced they will impose penalties, including imprisonment and fines, on citizens who visit Qatar or stay in violation of the embargo. Mohammed Jaber cannot take his father’s body to Saudi Arabia for burial, since the border with Qatar is closed. Meanwhile, Qatari students in Saudi Arabia, Bahrain and the UAE must stop attending universities there as well. If students are absent for a long time, their universities will dismiss them or—at the minimum—postpone their studies. 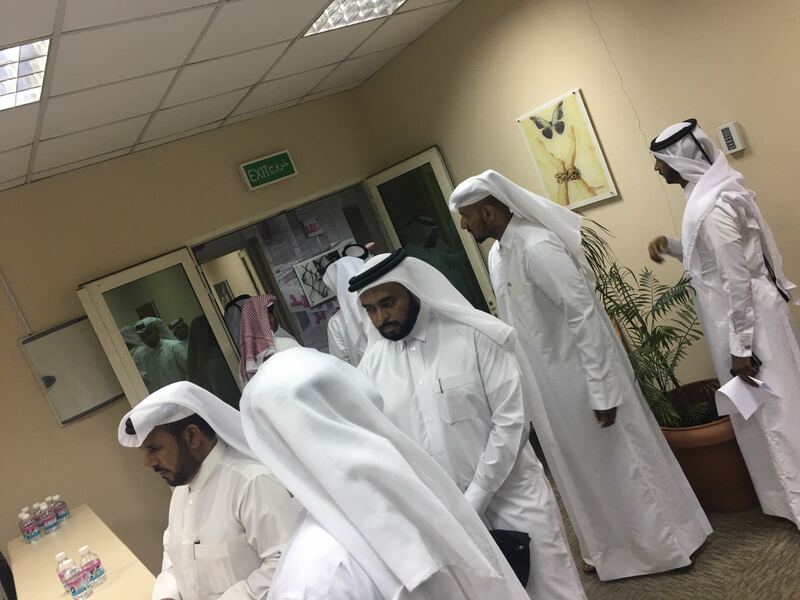 One Qatari student studying mathematics in Bahrain said all his courses for the rest of the year have been canceled immediately after the three states' May 5 decision. Likewise, an Emirati student reported that he had come to Doha a year ago to pursue his higher studies in political science, and now is being forced to leave for the UAE, unsure if he'll be able to return to complete his second year. "The decision of the ruling authorities in the three Gulf states to criminalize ’sympathy’ with Qatar" represents a flagrant violation of the fundamental right to freedom of opinion and expression," says Meera Bishara, a Euro-Med Monitor legal adviser. Euro-Med also points to the statements of UAE Attorney General Hamad Saif Al Shamsi, who said officials must consider "showing sympathy with Qatar through social media a crime punishable by imprisonment of three to 15 years or at least Dh500,000 in fines." Likewise, the state-controlled Saudi Arabian media are persecuting “offenders” under cybercrime laws, and Bahrain's Interior Ministry has announced its intent to punish anyone who expresses support for Qatar with five years in prison and a fine. Punishment for merely expressing opinions is a departure from the goals set by the international Internet Crime and Information Crimes Law, is an expansion of the rules governing criminalization and punishment for political purposes, and conflicts with the UAE Constitution and criminal code. "International standards do not allow any arbitrary restrictions on freedom of opinion and expression unless it constitutes a real threat to national security or includes slander,” say Euro-Med experts. “The punishment of people for expressing sympathy with any party constitutes such an unjustified arbitrary restriction." Euro-Med calls on Saudi Arabia, United Arab Emirates and Bahrain to review their decisions quickly and amend them to avoid negative effects on citizens and protect their rights. "The three countries are required to abide by their obligations under the International Covenant on Civil and Political Rights and the International Covenant on Economic, Social and Cultural Rights, which state that citizens should be spared the effects of political decisions that curtail their rights to expression, labor and family unity," says Bishara.